Liu Jin Yuan / Ah Qi- game or drama? Do you like Evil Ah Qi? He was ok. No comment. I don't remember liking him at all in the game. I think he's changed quite a bit from the game to the series and has been made more significant. What do you guys think of the changes? Did you like how he learns to "fight"? Do you guys like evil Ah Qi? Nah..I didnt like how he suddenly knew how to fight..but did he even know how to fight? O__o Was role was there of him turning evil except find out tips on the love thing. erm...judging from his performance in the fighting contest with Yue Ru at the beginning, I find it too unrealistic for him to know how to fight. Is this guy even in the game? I don't recall anyone who acted evil to help XY. In the game this guy only complained a bit after the wedding contest and later played as the butterfly girl's husband. They have added quite a lot to him in the drama. oh he is yueru's cousin? ryshi wrote: oh he is yueru's cousin? he did "fight" in the drama, which of course looks very funny there due to his very poor ability (but in game he just complained). 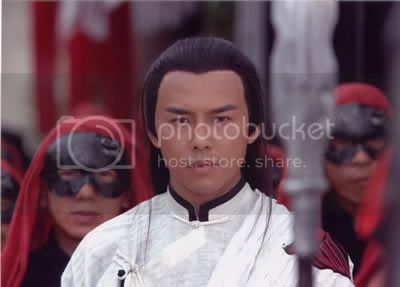 Re: Liu Jin Yuan / Ah Qi- game or drama? They wanted more characters in the story, and just made minor characters from the game more significant- like Tang Yu, Sheng Gu..
AT least I remembered Liu Jin Yuan from the game... never even noticed Tang Yu, lol. I'm pretty sure Jin Yuan couldn't really fight. He got some knowledge of martial arts from reading books but he's never been properly trained. That was clear during his battle with Xiao Yao.